Wandering bard Gorlen Vizenfirthe makes a re-appearance in F&SF after a ten year absence, no doubt good news for those who delight in cod-mediaeval bardery, with a heigh-ho nonny no. In entering a village he bespies the sign identifying the name of the village (in the title) and ponders the reason for such a name, and with a heigh-ho nonny no the mystery is duly reveal-ed. Charles Coleman Finlay. The Political Prisoner. Finlay’s earlier story ‘The Political Officer’ garnered praise in many quarters, to the extent it was a Hugo nomination, although it didn’t move me greatly. This time Nikomedes is under cover on an alien planet, and there some identity hiding, spy thriller espionage excitement and shootouts, but not really a grabber for me. You can whizz through the story like a knife through butter, which The Da Vinci Code did to great commercial effect, but the speed of it makes it difficult to engage with the characters and their challenges. For me, more suited to Ellery Queen’s Mystery Magazine, or Ian Fleming’s Cold War Spy Story Magazine. Scott Dalrymple. An Open Letter to Earth. Short piece by way on an apologia from those pesky aliens. Stephen Popkes. Another Perfect Day. Prokofiev gets a visit from a time travelling dude form the future. Except that this Prokofiev isn’t the one with the music at his fingertips. However, having despatched the visitor, he is the Prokofiev with the musical scores at his fingertips, and that will do him nicely. An unsettling short piece, in which a man is hunted down by a team of bounty hunters. It appears that the man has transgressed some major boundaries, but as we find out the nature of those boundaries, and those who are enforce them, are the disturbing ones – are we really in danger of heading this way? Richard Mueller. “But Wait! There’s More!”. A down-on-his-luck scriptwriter finds a writing opportunity that seems too good to be true, and true enough, if it does seem to good to be true then it probably is. He ends up writing for a company attempting to save souls for those willing to sell them. Is he willing to sell his soul for the good pay that comes his way. What are the consequences of getting in with this crowd? Not the strongest issue of late, especially if the Finlay story doesn’t do it for you. Rand B. Lee providing the most thought-provoking story, in one of the shorter stories in the issue. Go figure. 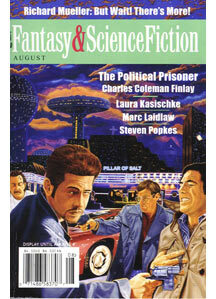 Mind you, I’m writing this half way through reading the next issue of F&SF, which is a doozy, so maybe this issue is paling in comparison.